Buckle up ’cause Adam is going to Mars. The captain of this ship? Takashi Miike. Our purpose? To clean Mars of Cockroaches. Arrow Video has done the world a huge favor by releasing the truly deranged Terra Formas on Blu-Ray. 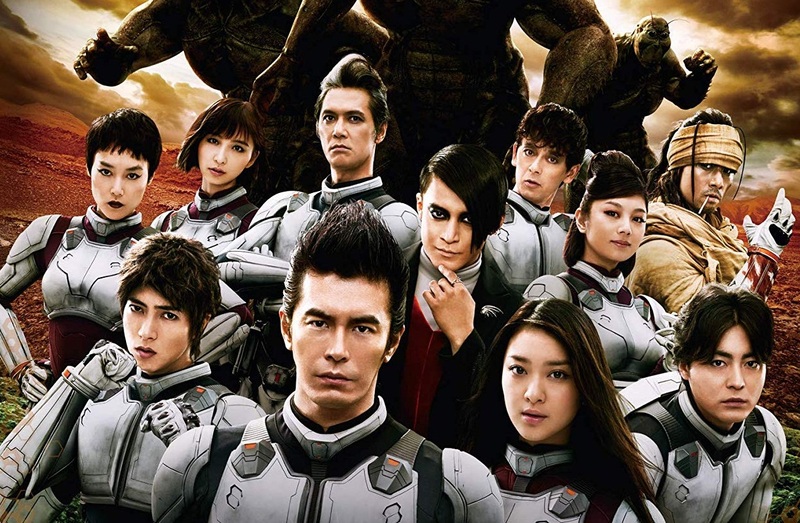 Takashi Miike is in fine form with the lunatic Terra Formars which is part Sci-fi adventure part kaiju epic. This one is on par with Starship Troopers without the critique of Facism. A group of criminal are given a chance at “Fortune and Glory” by going to Mars to eradicate all the insects brought by a terraforming expedition. Little do these criminals know they are at the mercy of the trillion are eccentric that has funded this mission. Given powers and a suicide mission this group of a dozen men and women must work together for their survival. From the above description one would not think this film is anything more than a standard “men on a mission” film set in Space ala James Cameron’s Aliens. You would be wrong, very wrong. Miike adapting the manga of the same name has made a film that makes some bold choices that seem goofy at first but make the film even better upon retrospect. That Miike instinct to go the path less traveled works in this case. The design of not only the cockroaches but the other bugs as well seems goofy, and from 60 s Japanese Sci-fi but that’s the point. Miike is making his own Godzilla movie where Godzilla’s universe rules don’t apply. As the movie’s plot and end game begin to formulate Miike goes in to overdrive with set pieces that recall just as much “superhero” as it does the best of the Japanese Martial Arts movies of the 1970s. Terra Formars is Miike on a grand scale and a huge budget. The results are so on brand for the director one will wonder how he convinced a Japanese studio to Fund this one. No matter, this is the real deal. If you’re a Miike fan or a fan of cult genre cinema you owe it to yourself to spend an evening with this one. It’s a winner! The transfer that was provided to Arrow is drop dead gorgeous. The razor sharp image does not disappoint. Making of Terra Formars – is an 87-minutes epic feature length documentary. The entire Cast and Crew including Miike himself contribute to the documentary. The doc covers everything from the announcement, the casting, pre-production, filming in Japan and in Iceland (with the help of Interstellar production crew), special effects, motion capture (with Miike showing up as one of the Mo-Cap actors), makeup effects, post-production and release. No stone is left unturned. For anyone that’s into this movie, this is a treasure trove and wealth of information on the production. Japanese with English Subtitles. Hideaki Ito – is a 10-minute interview with the ostensive lead of the film. The questions are prompted by black and white title cards. Ito approaches everything with humor and good grace. These are not the typical questions asked in English Released. Japanese w/ subtitles. Emi Takei – is a 7-minute interview with the actress where she talks about getting the role and other various aspects of the production. Like Ito’s interview some of the questions are not typical questions. Additionally, the prompts are done with title cards. Japanese with subtitles. Tomohisa Yamashita – is an 11-minute interview with the actor. He discusses if he liked the way his character was introduced, the complexity of the visual effects work and other various pieces. Like Ito’s interview some of the questions are not typical questions. Additionally, the prompts are done with title cards. Japanese with subtitles. Takayuki Yamada – is an 8-minute interview with the actor. The question range from what he thought of the film to what he enjoyed most about the film. Like The rest of the interviews some of the questions are not typical questions. Additionally, the prompts are done with title cards. Japanese with subtitles. Shun Oguri – is a 12-minute interview with the actor. Like his fellow cast members the questions range from the silly to thoughtful. Like Ito’s interview some of the questions are not typical questions. Additionally, the prompts are done with title cards. Japanese with subtitles. 5-Minutes if b-roll/outtake footage is as fascinating as the making-of but in its raw form without any sort of commentary. Rounding out the special features are two Teasers, one theatrical trailer and a still gallery. The two teasers are just that, similar to any other big budget film. The theatrical trailer is big and gutsy. The still gallery can be auto played for 12-minutes or searched individually. I found myself fascinated with the stills as they gave you more detail and just how much was put into the production design. The gallery may be one of my favorite features on the disc. Terra Fomars is peak Miike working on a huge budget. Many will delight in this crazy Sci-Fi action epic. Highly Recommended!!! !